The Flash celebrates 100 episodes with a trip down memory lane to revisit some key moments in the show’s history. Anniversary episodes are self indulgent by their very nature. This very website recently released its 100th podcast and that was a very self indulgent affair. Listen if you get the chance, it’s a lot of fun if I do say so myself and also revisits points in the history of the podcast to celebrate the milestone. It should also be noted that I’ve reviewed all 100 episodes of this show so that’s something to be proud of as well. Now that I’ve got the personal advertisement out of the way, I’ll actually get to covering this episode of The Flash. The excuse for travelling back in time is that Team Flash need to fashion a weapon that can disrupt Cicada’s dagger. The best way to do this is to take a piece of Savitar’s suit and combine it with the device that was used to drain Barry of his speed back in “Versus Zoom” before using the particle accelerator explosion to infuse it with Dark Matter. It’s all just busy work that creates an excuse to revisit these moments and highlight everything the show has accomplished over the past 100 episodes. 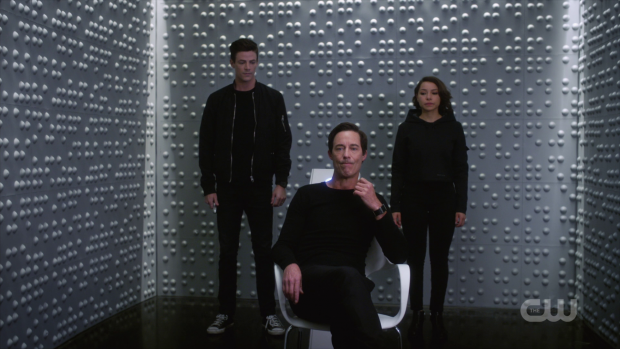 Barry takes Nora with him on his trip to the past. This makes a lot of sense from a characterisation point of view as this season has been all about Nora learning about Barry outside of what is recorded in the Flash museum. It has been well established that she knows the events as recorded really well and it has also been made clear that the recorded history isn’t entirely accurate. I found myself wondering what Nora’s perception of Barry’s battles with Savitar, DeVoe and Zoom is but the episode doesn’t explore that. The closest it comes to doing that is a shocked look on her face when she sees that Savitar was a twisted duplicate of Barry and witnesses Iris killing him. Perspective can be a great storytelling tool that can make something that would otherwise be derivative feel fresh. Barry revisiting key events in his personal timeline isn’t all that interesting on its own beyond the novelty of seeing these events play out again with him in the background but add Nora to the mix and suddenly these events take on a whole new life. One thing the episode takes time to show is the Barry and Iris relationship at an earlier point in the show’s history. Nora looks on at a conversation between them right after Barry lost his speed and sees Iris offering her support at Barry’s most vulnerable point which allows Nora to get a deeper insight into the connection that their parents have because she sees them at a point before they were officially a couple. In the current present timeline of the show she knows them as an established married couple but this lets her see a snippet of what led them to that point. It’s clearly illuminating for her and brilliantly played by Jessica Parker Kennedy. Naturally the episode focuses on the season long antagonists though thankfully leaves DeVoe and the regrettable season 4 out of the equation while also relegating the difficult third season to a very small part of it. Zoom doesn’t even receive that much attention though he does discover Barry and Nora before giving chase. 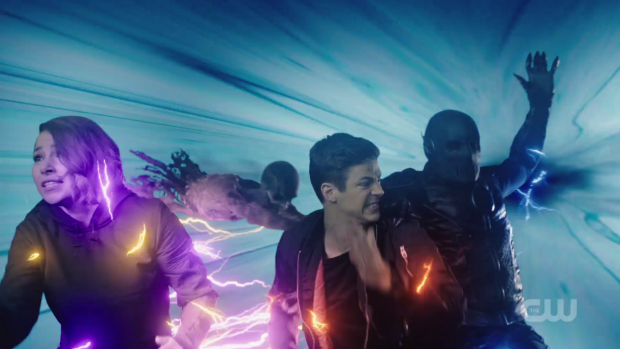 He follows them into the Speed Force and is dragged off by a Time Wraith to presumably correct that error. This seemed pointless to me as it should have been game changing in some way but was glossed over almost entirely. Zoom discovering Barry and Nora should have had consequences of some sort but it didn’t. It was such a lazy and clumsily put together moment that was clearly designed to create tension at that point in the episode but would have been been better left out entirely because of all the questions it raises. Of course, the lion’s share of the attention goes to Eobard Thawne aka the Reverse Flash. No other villain in the show’s history has come close to measuring up to this threat. Tom Cavanagh plays this version of the character twice in this episode and he nails them both. One of these takes place during the events of “Flash Back” which also had a time displaced Barry risking making a mess of the timeline. 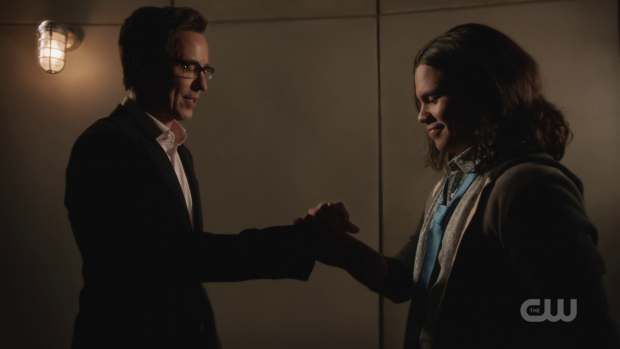 It’s a great scene because it allows Tom Cavanagh to fully embrace the Eobard Thawne persona without hiding behind Harrison Wells. This makes for great viewing because Thawne holds all the cards despite Barry having knowledge that he doesn’t Some choice name dropping and general intimidation help to reinforce how great an antagonist Thawne was in the show’s first season while serving as easter eggs for fans of the comics. Dawn Allen gets a mention with the implication that Thawne’s initial meddling in the timeline might have prevented her from existing. Nora could have basically replaced Dawn though that’s just speculation on my part. 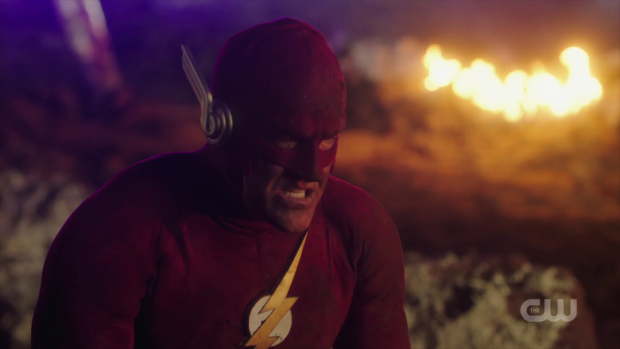 The other portrayal of Eobard Thawne takes place during the events of “Pilot” right before the particle accelerator explosion. He talks to Cisco about what they are about to accomplish and how important Cisco was in making it happen. The subtext of this conversation is great because of the audience knowledge that Thawne is being dishonest about his intentions but is completely genuine about how highly he regards Cisco. Their relationship was always well handled and the added complexity of Thawne valuing that relationship despite his hidden agenda made it all the more compelling. This scene was an excellent reminder of the complex and well written relationship that once existed and made me pine or the days where it was the norm. Barry and Nora’s journey to this time period gives Nora more detail on her father’s past. She learns that Eobard Thawne killed Barry’s mother to make him experience a tragedy that would prevent him from becoming the Flash and her reaction delivers everything that needs to be said about it. Once again this is something not recorded in the Flash museum and learning this is another way for her to better understand who her father is as a person. Knowing about his past and the hardships he has endured further establishes to her that he is a human being who doesn’t have all the answers and has his own inner demons that he struggles with. Kudos to Grant Gustin for an excellent performance in this scene that draws on the pain Barry carries with him every day. Paying that off when Nora goes to the past to see her grandparents from a distance while Barry joins her was a great touch. 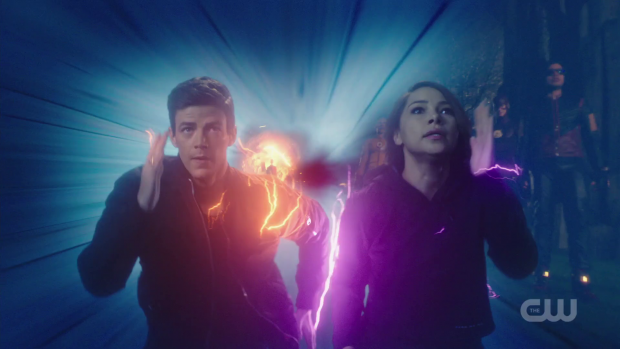 There is a lot of good stuff in this episode, mostly thanks to the performances of Grant Gustin and Jessica Parker Kennedy but as a celebration of 100 episodes of a TV show it falls short. Arrow did a lot better job paying tribute to everything that made the show what it was in its 100th episode but The Flash does little more than deliver a superficial look at some of the events that have come before. Seeing these is meaningful for Nora and, to a lesser extent, Barry but in the broader context of The Flash as a TV show that has a large cast there isn’t much to celebrate what they contributed. Iris has very little input into the events other than a barely heard conversation in the past, Joe doesn’t appear at all outside of archive footage, Wally is barely mentioned and very little attention is given to Cisco or Caitlin. Ronnie’s merging with Martin Stein plays out again and Caitlin is visibly uncomfortable reliving that memory prior to the time travel but that’s really it in terms of her contribution to the celebration. At least Cisco gets that scene with Thawne but that’s more about their specific connection rather than Cisco himself. Barry and Nora’s efforts seem to pay off when the confrontation with Cicada appears to be going well until it turns out that he can summon his dagger even after it has been breached into outer space. It doesn’t take long for the team to be on the back foot until Killer Frost makes an appearance and shows that she is able to use her abilities since they aren’t created by Dark Matter. She is identified as the key to defeating him so it should only be a matter of time before Cicada is defeated. I get the impression that Cicada has all but run his course as a villain. The writers have done a great job building this character over a short period of time. He comes across as enough of a threat for the moment but definitely doesn’t have the chops to last the entire season. The latest insight into him is that he plans to kill himself when his mission is complete because he can’t stand the fact that he’s also a Metahuman. There could be some mileage in Team Flash moralising over whether they should let someone take their own life or not but beyond that I can’t see there being a lot left to do with this villain. Ending that villain arc in this episode would have been more than acceptable. It was teased earlier in the season that Sherloque was suspicious of Nora. This thread is picked up in this episode when he steals her journal and looks into decoding the language she writes in. Nora calls it a time language and explains that it is somehow immune to any alterations in the timeline which means she will always have an accurate record of the events. Sherloque doesn’t believe that she’s being entirely honest and uses Cisco’s algorithm to decode it which confirms his suspicions though it’s unclear what he plans to do about them. It turns out he’s right to be suspicious judging by Nora running to the future to talk to an imprisoned Eobard Thawne. She’s clearly annoyed at him, most likely because of learning that he killed Barry’s mother but it’s clear that she is working with him for reasons that are as yet unknown and is sending him messages through Gideon. I suspect the answer will be that Nora has been misled by Thawne and has been manipulated by him in some way rather than her turning out to be a villain but she has definitely been less than honest which will no doubt create fiction in the coming episodes. The end of the episode brought another playing of the tease for next week’s crossover. I am excited to watch it and excited to cover it. A solid episode that sets itself the task of celebrating what the show has accomplished in 100 episodes and succeeds to some extent but fails to cover everything it has to offer. The conceit of travelling back in time to visit key events in the show’s history is a decent enough idea and bringing Nora along is a good way to deliver a different perspective on what has come before. Highlights include her seeing Iris comforting Barry after he lost his speed and learning that Eobard Thawne killed Barry’s mother to prevent him from becoming the Flash. Jessica Parker Kennedy’s performance throughout is excellent and the scenes definitely hit the right emotional beats. Tom Cavanagh’s unbeatable portrayal of Eobard Thawne is given due attention with two excellent appearances showcasing the different sides of the season 1 iteration of the character. The problem is that it falls short as a celebration of such a huge milestone. Most of the characters are barely featured which is wrong considering they deserve to have their contribution to the show recognised in some way. Outside of some good stuff with Nora revisiting the past does little more than deliver a superficial look at the events. There is a real lack of consequence to anything that goes on as exemplified by Zoom following them into the Speed Force and being unceremoniously carted off by a Time Wraith with no apparent impact on the overall timeline. The battle with Cicada starts off promising but ends badly because the extent of his powers are misjudged meaning that Team Flash lose the advantage fairly quickly until Killer Frost appears and is able to combat him because her powers aren’t based in Dark Matter. Killer Frost is now the key to defeating Cicada who feels as if he has nearly run his course at this point. That’s not a bad thing as the writers have done a great job developing him but he definitely doesn’t have the chops to be a season long threat. I suspect he will be wrapped up in favour of something else relatively soon. 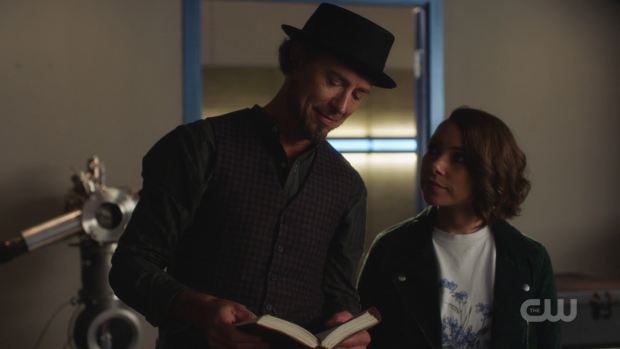 Addressing Sherloque’s suspicion of Nora when she investigates the language in her diary and learns that she is being less than honest is really well done and the reveal that she is working with Eobard Thawne for reasons that are unclear is appropriately shocking. She does seem angry with him, most likely because she has recently learned what he did to her grandmother. I don’t think Nora will turn out to be a villain but she has definitely been less than honest and is most likely being manipulated. The episode ends with another tease of the crossover. I’m really excited to both watch it and cover it.